- Publisher Enter into $lt;I>The Hiding Place$lt;/I> to relive Corrie ten Boom's heart-pounding account as a leader in the Dutch Underground during World War II. In this latest release from Focus on the Family's Radio Theatre, you'll find tragedy, perseverance, and the reality of God's amazing love. With a cast of internationally acclaimed actors, cinema-quality sound effects, and full orchestration, you'll experience this classic, real-life story like never before. 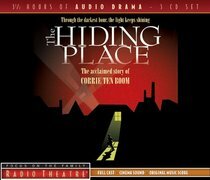 About "Radio Theatre: The Hiding Place (3 Cds)"
Enter into $lt;I>The Hiding Place$lt;/I> to relive Corrie ten Boom's heart-pounding account as a leader in the Dutch Underground during World War II. In this latest release from Focus on the Family's Radio Theatre, you'll find tragedy, perseverance, and the reality of God's amazing love. With a cast of internationally acclaimed actors, cinema-quality sound effects, and full orchestration, you'll experience this classic, real-life story like never before.